Trout Unlimited is an American non-profit organization dedicated to the conservation of freshwater streams, rivers, and associated upland habitats for trout, salmon, other aquatic species, and people. Often contracted as "TU," the organization began in 1959 in Michigan. It has since spread throughout the United States. The organization has developed tools such as the Conservation Success Index (CSI), a framework for assessing the health of coldwater fish species throughout their native range. Whether this range encompasses a few hundred miles or multiple states, the CSI helps the organization target its efforts toward those populations most in need of protection or restoration. Trout Unlimited is organized into "chapters," each of which is dedicated to a specific watershed in a specific area of the country. Examples include the "Little River Chapter," which safeguards the Little River watershed of East Tennessee, including sections of Great Smoky Mountains National Park. The West Virginia Council is made up of several regional chapters. Each chapter is a group of volunteers who elect their own officers and representatives to the national Trout Unlimited organization. Local chapter activities typically include stream restoration, education programs such as "Take a Child Fishing," and group activities. Stream restoration can include such things as removal of encroaching species of plant from streambanks, construction of retaining walls to prevent river erosion due to human use, and construction of weirs or small water breaks to provide trout habitat where none existed before. Recently, chapters have formed the Coldwater Conservation Corps. Members have been trained by environmental scientists to test water in streams at risk from pollution. Trout Unlimited intentionally modeled its name after Ducks Unlimited, Quail Unlimited, and other wildlife conservation organizations. This recognizes the need for public awareness these names create. Trout Unlimited is a national non-profit organization. It draws its funding partly from membership fees and contributions. Membership benefits include four quarterly issues of Trout Magazine, which is wholly owned by Trout Unlimited, as well as an annual calendar, name stamps, and other items. When a new subscriber signs up, he or she is assigned to a local chapter and encouraged to attend meetings. 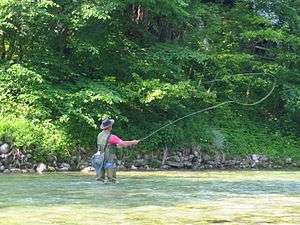 Most chapters meet at least once a month to organize and socialize, then meet on additional dates for streamside restoration. Projects undertaken by scientists and conservationists working for Trout Unlimited are funded through competitive grants as well as cost-share agreements with federal agencies such as the US Forest Service and National Park Service. These grants fund large projects such as dam and culvert removals, bank stabilization and restoration, in-stream habitat building.